Hungary and areas of east Austria, Croatia, Poland, Romania, northern Serbia, Slovakia, Slovenia, western Ukraine. Hungarian ( magyar nyelv (help·info)) is a Finno-Ugric language spoken in Hungary and parts of several neighbouring countries. It is the official language of Hungary and one of the 24 official languages of the European Union. 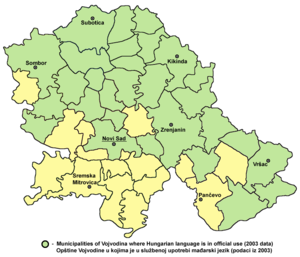 Outside Hungary it is also spoken by communities of Hungarians in the countries that today make up Slovakia, western Ukraine (Subcarpathia), central and western Romania (Transylvania), northern Serbia (Vojvodina), northern Croatia and northern Slovenia (Mur region). It is also spoken by Hungarian diaspora communities worldwide, especially in North America (particularly the United States and Canada) and Israel. Like Finnish and Estonian, Hungarian belongs to the Uralic language family. With 13 million speakers, it is the family's largest member by number of speakers. 7.2.2 Two words for "red"
Hungarian is a member of the Uralic language family. Linguistic connections between Hungarian and other Uralic languages were noticed in the 1670s, and the family itself (then called Finno-Ugric) was established in 1717. Hungarian has traditionally been assigned to the Ugric branch within the Finno-Ugric group, along with the Mansi and Khanty languages of western Siberia (Khanty–Mansia region), but it is no longer clear that it is a valid group. When the Samoyed languages were determined to be part of the family, it was thought at first that Finnic and Ugric (Finno-Ugric) were closer to each other than to the Samoyed branch of the family, but that is now frequently questioned. The name of Hungary could be a result of regular sound changes of Ungrian/Ugrian, and the fact that the Eastern Slavs referred to Hungarians as Ǫgry/Ǫgrove (sg. Ǫgrinŭ) seemed to confirm that. Current literature favors the hypothesis that it comes from the name of the Turkic tribe Onogur (which means "ten arrows" or "ten tribes"). 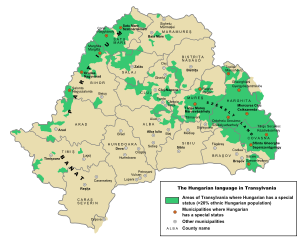 There are numerous regular sound correspondences between Hungarian and the other Ugric languages. For example, Hungarian /aː/ corresponds to Khanty /o/ in certain positions, and Hungarian /h/ corresponds to Khanty /x/, while Hungarian final /z/ corresponds to Khanty final /t/. For example, Hungarian ház [haːz] "house" vs. Khanty xot [xot] "house", and Hungarian száz [saːz] "hundred" vs. Khanty sot [sot] "hundred". The distance between the Ugric and Finnic languages is greater, but the correspondences are also regular. The traditional view holds that the Hungarian language diverged from its Ugric relatives in the first half of the 1st millennium BC, in western Siberia east of the southern Urals. The Hungarians gradually changed their lifestyle from being settled hunters to being nomadic pastoralists, probably as a result of early contacts with Iranian nomads (Scythians and Sarmatians). In Hungarian, Iranian loanwords date back to the time immediately following the breakup of Ugric and probably span well over a millennium. Among these include tehén ‘cow’ (cf. Avestan dhaénu); tíz ‘ten’ (cf. Avestan dasa); tej ‘milk’ (cf. Persian dáje ‘wet nurse’); and nád ‘reed’ (from late Middle Iranian; cf. Middle Persian nāy). Archaeological evidence from present day southern Bashkortostan confirms the existence of Hungarian settlements between the Volga River and the Ural Mountains. The Onogurs (and Bulgars) later had a great influence on the language, especially between the 5th and 9th centuries. This layer of Turkic loans is large and varied (e.g. szó "word", from Turkic; and daru "crane", from the related Permic languages), and includes words borrowed from Oghur Turkic; e.g. borjú "calf" (cf. Chuvash păru, părăv vs. Turkish buzağı); dél ‘noon; south’ (cf. Chuvash tĕl vs. Turkish dial. düš). Many words related to agriculture, state administration and even family relationships show evidence of such backgrounds. Hungarian syntax and grammar were not influenced in a similarly dramatic way over these three centuries. After the arrival of the Hungarians in the Carpathian Basin, the language came into contact with a variety of speech communities, among them Slavic, Turkic, and German. Turkic loans from this period come mainly from the Pechenegs and Cumanians, who settled in Hungary during the 12th and 13th centuries: e.g. koboz "cobza" (cf. Turkish kopuz ‘lute’); komondor "mop dog" (< *kumandur < Cuman). Hungarian borrowed many words from neighbouring Slavic languages: e.g. tégla ‘brick’; mák ‘poppy’; karácsony ‘Christmas’). These languages in turn borrowed words from Hungarian: e.g. Serbo-Croatian ašov from Hungarian ásó ‘spade’. About 1.6 percent of the Romanian lexicon is of Hungarian origin. Hungarian historian and archaeologist Gyula László claims that geological data from pollen analysis seems to contradict the placing of the ancient Hungarian homeland near the Urals. There have been attempts to show that Hungarian is related to other languages, such as Hebrew, Hunnic, Sumerian, Egyptian, Etruscan, Basque, Persian, Pelasgian, Greek, Chinese, Sanskrit, English, Tibetan, Magar, Quechua, Armenian, Japanese, and at least 40 other languages. Mainstream linguists dismiss these attempts as pseudoscientific comparisons with no merit. Today the consensus among linguists is that Hungarian is a member of the Uralic family of languages. The classification of Hungarian as a Uralic/Finno-Ugric rather than a Turkic language continued to be a matter of impassioned political controversy throughout the 18th and into the 19th centuries. During the latter half of the 19th century, a competing hypothesis proposed a Turkic affinity of Hungarian, or, alternatively, that both the Uralic and the Turkic families formed part of a superfamily of Ural–Altaic languages. Following an academic debate known as Az ugor-török háború ("the Ugric-Turkic battle"), the Finno-Ugric hypothesis was concluded the sounder of the two, mainly based on work by the German linguist Josef Budenz [de]. Hungarians did in fact absorb some Turkic influences during several centuries of cohabitation. For example, the Hungarians appear to have learned animal husbandry techniques from the Turkic Chuvash people, as a high proportion of words specific to agriculture and livestock are of Chuvash origin. A strong Chuvash influence was also apparent in Hungarian burial customs. The first written accounts of Hungarian, mostly personal name and place names, date to the 10th century. No significant texts written in Old Hungarian script have survived, as wood, the medium of writing in use at the time, was perishable. The Kingdom of Hungary was founded in 1000 by Stephen I. The country became a Western-styled Christian (Roman Catholic) state, with Latin script replacing Hungarian runes. The earliest remaining fragments of the language are found in the establishing charter of the abbey of Tihany from 1055, intermingled with Latin text. 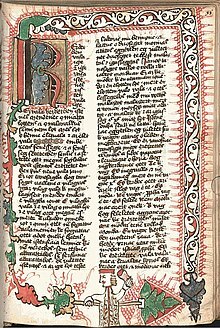 The first extant text fully written in Hungarian is the Funeral Sermon and Prayer, which dates to the 1190s. Although the orthography of these early texts differed considerably from that used today, contemporary Hungarians can still understand a great deal of the reconstructed spoken language, despite changes in grammar and vocabulary. A more extensive body of Hungarian literature arose after 1300. The earliest known example of Hungarian religious poetry is the 14th-century Lamentations of Mary. The first Bible translation was the Hussite Bible in the 1430s. 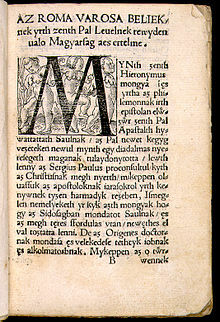 In 1533, Kraków printer Benedek Komjáti published the first Hungarian-language book set in movable type, a translation of the letters of Saint Paul entitled Az zenth Paal leueley magyar nyeluen (modern orthography: Az Szent Pál levelei magyar nyelven). By the 17th century, the language already closely resembled its present-day form, although two of the past tenses remained in use. German, Italian and French loans also began to appear. Further Turkish words were borrowed during the period of Ottoman rule (1541 to 1699). In the 18th century a group of writers, most notably Ferenc Kazinczy, spearheaded a process of nyelvújítás (language revitalization). Some words were shortened (győzedelem > győzelem, 'triumph' or 'victory'); a number of dialectal words spread nationally (e.g., cselleng 'dawdle'); extinct words were reintroduced (dísz, 'décor'); a wide range of expressions were coined using the various derivative suffixes; and some other, less frequently used methods of expanding the language were utilized. This movement produced more than ten thousand words, most of which are used actively today. The 19th and 20th centuries saw further standardization of the language, and differences between mutually comprehensible dialects gradually diminished. In 1920, Hungary signed the Treaty of Trianon, losing 71 percent of its territory and one-third of the ethnic Hungarian population along with it. Today the language holds official status nationally in Hungary and regionally in Romania, Slovakia, Serbia, Austria and Slovenia. Hungarian has about 13 million native speakers, of whom more than 9.8 million live in Hungary. According to the 2011 Hungarian census, 9,896,333 people (99.6% of the total population) speak Hungarian, of whom 9,827,875 people (98.9%) speak it as a first language, while 68,458 people (0.7%) speak it as a second language. About 2.2 million speakers live in other areas that were part of the Kingdom of Hungary before the Treaty of Trianon (1920). Of these, the largest group lives in Transylvania, the western half of present-day Romania, where there are approximately 1.25 million Hungarians. There are large Hungarian communities also in Slovakia, Serbia and Ukraine, and Hungarians can also be found in Austria, Croatia, and Slovenia, as well as about a million additional people scattered in other parts of the world. For example, there are more than one hundred thousand Hungarian speakers in the Hungarian American community and 1.5 million with Hungarian ancestry in the United States. The dialects of Hungarian identified by Ethnologue are: Alföld, West Danube, Danube-Tisza, King's Pass Hungarian, Northeast Hungarian, Northwest Hungarian, Székely and West Hungarian. These dialects are, for the most part, mutually intelligible. The Hungarian Csángó dialect, which is mentioned but not listed separately by Ethnologue, is spoken primarily in Bacău County in eastern Romania. The Csángó Hungarian group has been largely isolated from other Hungarian people, and they therefore preserved features that closely resemble earlier forms of Hungarian. Hungarian has 14 vowel phonemes and 25 consonant phonemes. The vowel phonemes can be grouped as pairs of short and long vowels such as o and ó. Most of the pairs have a similar pronunciation and vary significantly only in their duration. However, pairs a/á and e/é differ both in closedness and length. Consonant length is also distinctive in Hungarian. Most consonant phonemes can occur as geminates. The sound voiced palatal plosive /ɟ/, written ⟨gy⟩, sounds similar to 'd' in British English 'duty'. It occurs in the name of the country, "Magyarország" (Hungary), pronounced /ˈmɒɟɒrorsaːɡ/. It is one of three palatalised consonants, the others being ⟨ty⟩, ⟨ny⟩, and (historically) ⟨ly⟩. A single 'r' is pronounced as an alveolar tap (akkora 'of that size'), but a double 'r' is pronounced as an alveolar trill (akkorra 'by that time'), like in Spanish. Primary stress is always on the first syllable of a word, as in Finnish and the neighbouring Slovak and Czech. There is a secondary stress on other syllables in compounds: viszontlátásra ("goodbye") is pronounced /ˈvisontˌlaːtaːʃrɒ/. Elongated vowels in non-initial syllables may seem to be stressed to an English-speaker, as length and stress correlate in English. Hungarian, an agglutinative language, uses various affixes, mainly suffixes but also some prefixes and a circumfix, to change a word's meaning and its grammatical function. Hungarian uses vowel harmony to attach suffixes to words. That means that most suffixes have two or three different forms, and the choice between them depends on the vowels of the head word. There are some minor and unpredictable exceptions to the rule. Nouns have 18 cases, which are formed regularly with suffixes. The nominative case is unmarked (az alma 'the apple') and, for example, the accusative is marked with the suffix –t (az almát '[I eat] the apple'). Half of the cases express a combination of the source-location-target and surface-inside-proximity ternary distinctions (three times three cases); there is a separate case ending –ból/–ből meaning a combination of source and insideness: 'from inside of'. Possession is expressed by a possessive suffix on the possessed object, rather than the possessor as in English (Peter's apple becomes Péter almája, literally 'Peter apple-his'). Noun plurals are formed with–k (az almák ‘the apples’), but after a numeral, the singular is used (két alma ‘two apples’, literally ‘two apple’; not *két almák). Unlike English, Hungarian uses case suffixes and nearly always postpositions instead of prepositions. There are two types of articles in Hungarian, definite and indefinite, which roughly correspond to the equivalents in English. Adjectives precede nouns (a piros alma 'the red apple') and have three degrees: positive (piros 'red'), comparative (pirosabb 'redder') and superlative (a legpirosabb 'the reddest'). If the noun takes the plural or a case, an attributive adjective is invariable: a piros almák 'the red apples'. However, a predicative adjective agrees with the noun: az almák pirosak 'the apples are red'. Adjectives by themselves can behave as nouns (and so can take case suffixes): Melyik almát kéred? – A pirosat. 'Which apple would you like? – The red one'. Verbs are conjugated according to two tenses (past and present), three moods (indicative, conditional and imperative-subjunctive), two numbers (singular or plural), three persons (first, second and third) and definiteness. The last feature is most characteristic: the definite conjugation is used with a transitive verb whose (direct) object is definite (Péter eszi az almát. "Peter eats the apple". ), but the indefinite conjugation either for a verb with an indefinite direct object (Péter eszik egy almát. "Peter eats an apple".) or for a verb without an object. (Péter eszik. "Peter eats". )[clarification needed] Since conjugation expresses the person and number, personal pronouns are usually omitted except for emphasis. The present tense is unmarked, and the past is formed by using the suffix –t or –tt: hall 'hears'; hallott 'heard', past. Future may be expressed with the present tense (usually with a word defining the time of the event: holnap 'tomorrow') or by using the auxiliary verb fog (similar to the English 'will'), followed by the infinitive. The indicative mood and the conditional mood are used both in the present and the past tenses. The conditional past is expressed by using the conjugated past form and the auxiliary word volna (hallott volna 'would have heard'). The imperative mood is used only in the present tense. Verbs have verbal prefixes, which are also known as coverbs. Most of them define direction of movement: lemegy "goes down", felmegy "goes up". Some verbal prefixes give an aspect to the verb, such as the prefix meg-, which generally marks telicity. Vowel harmony also plays a major role in verb conjugations. All Hungarian verb conjugations (as well as postpositions and possessive suffixes, for that matter) can be thought of as 'templates' into which vowels are inserted. Based on the nature of a verb's infinitive, which always ends in '-ni', one can create a generic 'template', which has mostly consonants. The vowels are then inserted into the 'template' according to the rules of vowel harmony, based on the categorization of the vowel in the verb root (front, back, rounded, unrounded). The neutral word order is subject–verb–object (SVO). However, Hungarian, a topic-prominent language, has a word order that depends not only on syntax but also on the topic-comment structure of the sentence (for example, what aspect is assumed to be known and what is emphasized). A Hungarian sentence generally has the following order: topic, comment (or focus), verb and the rest. The topic shows that the proposition is only for that particular thing or aspect, and it implies that the proposition is not true for some others. For example, in "Az almát János látja". ('It is John who sees the apple'. Literally 'The apple John sees. '), the apple is in the topic, implying that other objects may be seen by not him but other people (the pear may be seen by Peter). The topic part may be empty. The focus shows the new information for the listeners that may not have been known or that their knowledge must be corrected. For example, "Én vagyok az apád". ('I am your father'. Literally, 'It is I who am your father'. ), from the movie The Empire Strikes Back, the pronoun I (én) is in the focus and implies that it is new information, and the listener thought that someone else is his father. Although Hungarian is sometimes described as having free word order, different word orders are generally not interchangeable, and the neutral order is not always correct to use. Also, the intonation is also different with different topic-comment structures. The topic usually has a rising intonation, the focus having a falling intonation. In the following examples, the topic is marked with italics, and the focus (comment) is marked with boldface. János látja az almát. - 'John sees the apple'. Neutral sentence. Ön (önözés): Use of this form in speech shows respect towards the person addressed, but it is also the common way of speaking in official texts and business communications. Here "you", the second person, is grammatically addressed in the third person. Maga (magázás, magázódás): Use of this form serves to show that the speakers wish to distance themselves from the person they address. A boss could also address a subordinate as maga. Aside from the different pronoun it is grammatically the same as "önözés". Néni/bácsi (tetszikezés): This is a somewhat affectionate way of expressing politeness and is grammatically the same as "önözés" or "magázódás", but adds a certain verb in auxiliary role "tetszik" ("like") to support the main verb of the sentence. For example, children are supposed to address adults who are not parents, close friends or close relatives by using "tetszik" ("you like"): "Hogy vagy?" ("How are you?") here becomes "Hogy tetszik lenni?" ("How do you like to be?"). The elderly, especially women, are generally addressed this way, even by adults. Te (tegezés, tegeződés or pertu, per tu from Latin): Used generally, i.e. with persons with whom none of the above forms of politeness is required, and, in religious contexts, to address God. The highest rank, the king, was traditionally addressed "per tu" by all, peasants and noblemen alike, though with Hungary not having had any crowned king since 1918, this practice survives only in folk tales and children's stories. Use of "tegezés" in the media and advertisements has become more frequent since the early 1990s. It is informal and is normally used in families, among friends, colleagues, among young people, and by adults speaking to children; it can be compared to addressing somebody by their first name in English. Perhaps prompted by the widespread use of English (a language without T–V distinction in most contemporary dialects) on the Internet, "tegezés" is also becoming the standard way to address people over the Internet, regardless of politeness. The four-tiered system has somewhat been eroded due to the recent expansion of "tegeződés". Some anomalies emerged with the arrival of multinational companies who have addressed their customers in the te (least polite) form right from the beginning of their presence in Hungary. A typical example is the Swedish furniture shop IKEA, whose web site and other publications address the customers in te form. When a news site asked IKEA—using the te form—why they address their customers this way, IKEA's PR Manager explained in his answer—using the ön form—that their way of communication reflects IKEA's open-mindedness and the Swedish culture. However IKEA in France uses the polite (vous) form. Another example is the communication of Telenor (a mobile network operator) towards its customers. Telenor chose to communicate towards business customers in the polite ön form while all other customers are addressed in the less polite te form. During the first early phase of Hungarian language reforms (late 18th and early 19th centuries) more than ten thousand words were coined, several thousand of which are still actively used today (see also Ferenc Kazinczy, the leading figure of the Hungarian language reforms.) Kazinczy's chief goal was to replace existing words of German and Latin origins with newly-created Hungarian words. As a result, Kazinczy and his later followers (the reformers) significantly reduced the formerly high ratio of words of Latin and German origins in the Hungarian language, which were related to social sciences, natural sciences, politics and economics, institutional names, fashion etc. Giving an accurate estimate for the total word count is difficult, since it is hard to define "a word" in agglutinating languages, due to the existence of affixed words and compound words. To obtain a meaningful definition of compound words, we have to exclude such compounds whose meaning is the mere sum of its elements. The largest dictionaries giving translations from Hungarian to another language contain 120,000 words and phrases (but this may include redundant phrases as well, because of translation issues)[clarification needed]. The new desk lexicon of the Hungarian language contains 75,000 words and the Comprehensive Dictionary of Hungarian Language (to be published in 18 volumes in the next twenty years) is planned to contain 110,000 words. The default Hungarian lexicon is usually estimated to comprise 60,000 to 100,000 words. (Independently of specific languages, speakers actively use at most 10,000 to 20,000 words, with an average intellectual using 25,000 to 30,000 words.) However, all the Hungarian lexemes collected from technical texts, dialects etc. would total up to 1,000,000 words. Parts of the lexicon can be organized using word-bushes. (See an example on the right.) The words in these bushes share a common root, are related through inflection, derivation and compounding, and are usually broadly related in meaning. The basic vocabulary shares some hundreds word roots with other Uralic languages like Finnish, Estonian, Mansi and Khanty. Examples are the verb él "live" (Finnish elää), the numbers kettő (2), három (3), négy (4) (cf. Mansi китыг kitig, хурум khurum, нила nila, Finnish kaksi, kolme, neljä, Estonian kaks, kolm, neli, ), as well as víz 'water', kéz 'hand', vér 'blood', fej 'head' (cf. Finnish and Estonian vesi, käsi, veri, Finnish pää, Estonian pea or pää). Words for elementary kinship and nature are more Ugric, less r-Turkic and less Slavic. Agricultural words are about 50% r-Turkic and 50% Slavic; pastoral terms are more r-Turkic, less Ugric and less Slavic. Finally, Christian and state terminology is more Slavic and less r-Turkic. The Slavic is most probably proto-Slovakian and/or -Slovenian. This is easily understood in the Uralic paradigm, proto-Magyars were first similar to Ob-Ugors who were mainly hunters, fishers & gatherers, but with some horses, too. Then they accultured to Bulgarian r-Turks, so the older layer of agriculture words (wine, beer, wheat, barley &c.) are purely r-Turkic, and also lots of termini of statesmanship & religion were, too. Except for a few Latin and Greek loan-words, these differences are unnoticed even by native speakers; the words have been entirely adopted into the Hungarian lexicon. There are an increasing number of English loan-words, especially in technical fields. Another source differs in that loanwords in Hungarian are held to constitute about 45% of bases in the language. Although the lexical percentage of native words in Hungarian is 55%, their use accounts for 88.4% of all words used (the percentage of loanwords used being just 11.6%). Therefore, the history of Hungarian has come, especially since the 19th century, to favor neologisms from original bases, whilst still having developed as many terms from neighboring languages in the lexicon. Words can be compounds or derived. Most derivation is with suffixes, but there is a small set of derivational prefixes as well. Compounds have been present in the language since the Proto-Uralic era. Numerous ancient compounds transformed to base words during the centuries. Today, compounds play an important role in vocabulary. According to current orthographic rules, a subordinative compound word has to be written as a single word, without spaces; however, if the length of a compound of three or more words (not counting one-syllable verbal prefixes) is seven or more syllables long (not counting case suffixes), a hyphen must be inserted at the appropriate boundary to ease the determination of word boundaries for the reader. Other compound words are coordinatives: there is no concrete relation between the prefix and the suffix. Subcategories include reduplication (to emphasise the meaning; olykor-olykor 'really occasionally'), twin words (where a base word and a distorted form of it makes up a compound: gizgaz, where the suffix 'gaz' means 'weed' and the prefix giz is the distorted form; the compound itself means 'inconsiderable weed'), and such compounds which have meanings, but neither their prefixes, nor their suffixes make sense (for example, hercehurca 'complex, obsolete procedures'). Hungarian words for the points of the compass are directly derived from the position of the Sun during the day in the Northern hemisphere. There are two basic words for "red" in Hungarian: "piros" and "vörös" (variant: "veres"; compare with Estonian "verev" or Finnish "punainen"). (They are basic in the sense that one is not a sub-type of the other, as the English "scarlet" is of "red".) The word "vörös" is related to "vér", meaning "blood" (Finnish and Estonian "veri"). When they refer to an actual difference in colour (as on a colour chart), "vörös" usually refers to the deeper (darker and/or more red and less orange) hue of red. In English similar differences exist between "scarlet" and "red". While many languages have multiple names for this colour, often Hungarian scholars assume this is unique in recognizing two shades of red as separate and distinct "folk colours". However, the two words are also used independently of the above in collocations. "Piros" is learned by children first, as it is generally used to describe inanimate, artificial things, or things seen as cheerful or neutral, while "vörös" typically refers to animate or natural things (biological, geological, physical and astronomical objects), as well as serious or emotionally charged subjects. When the rules outlined above are in contradiction, typical collocations usually prevail. In some cases where a typical collocation does not exist, the use of either of the two words may be equally adequate. Expressions where "red" typically translates to "piros": a red road sign, red traffic lights, the red line of Budapest Metro, red (now called express) bus lines in Budapest, a holiday shown in red in the calendar, ruddy complexion, the red nose of a clown, some red flowers (those of a neutral nature, e.g. tulips), red peppers and paprika, red card suits (hearts and diamonds), red stripes on a flag (but the red flag and its variants translate to "vörös"), etc. Expressions where "red" typically translates to "vörös": Red Sea, Red Square, Red Army, Red Baron, Erik the Red, red wine, red carpet (for receiving important guests), red hair or beard, red lion (the mythical animal), the Red Cross, the novel The Red and the Black, redshift, red giant, red blood cells, red oak, some red flowers (those with passionate connotations, e.g. roses), red fox, names of ferric and other red minerals, red copper, rust, red phosphorus, the colour of blushing with anger or shame, the red nose of an alcoholic (in contrast with that of a clown, see above), the red posterior of a baboon, red meat, regular onion (not the red onion, which is "lila"), litmus paper (in acid), cities, countries, or other political entities associated with leftist movements (e.g. Red Vienna, Red Russia), etc. The Hungarian words for brothers and sisters are differentiated based upon relative age. There is also a general word for "sibling": testvér, from test "body" and vér "blood"; i.e., originating from the same body and blood. Fia is only used in this, irregular possessive form; it has no nominative on its own (see inalienable possession). However, the word fiú can also take the regular suffix, in which case the resulting word (fiúja) will refer to a lover or partner (boyfriend), rather than a male offspring. meg- verb prefix; in this case, it means "completed"
-ség like English "-ness", as in "holiness"
-t(e)len variant of "-tlen", noun suffix expressing the lack of something; like English "-less", as in "useless"
-het expresses possibility; somewhat similar to the English modal verbs "may" or "can"
-(e)tlen another variant of "-tlen"
-ked attached to an adjective (e.g. "strong"), produces the verb "to pretend to be (strong)"
-ért approximately translates to "because of", or in this case simply "for"
Translation: "for your [plural] repeated pretending to be indesecrable"
"like those of you that are the very least possible to get desecrated"
Words of such length are not used in practice, but when spoken they are easily understood by natives. They were invented to show, in a somewhat facetious way, the ability of the language to form long words (see agglutinative language). They are not compound words—they are formed by adding a series of one and two-syllable suffixes (and a few prefixes) to a simple root ("szent", saint or holy). There is virtually no limit for the length of words, but when too many suffixes are added, the meaning of the word becomes less clear, and the word becomes hard to understand, and will work like a riddle even for native speakers. shako, from csákó, from csákósüveg "peaked cap"
heyduck, from hajdúk, plural of hajdú "brigand"
tolpatch, from talpas "foot-soldier", apparently derived from talp "sole". 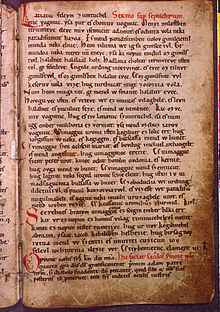 The oldest surviving words written in Hungarian, from the founding declaration of the Benedictine Abbey of Tihany, 1055. The Hungarian language was originally written in right-to-left Old Hungarian runes, superficially similar in appearance to the better-known futhark runes but unrelated. When Stephen I of Hungary established the Kingdom of Hungary in the year 1000, the old system was gradually discarded in favour of the Latin alphabet and left-to-right order. Although now not used at all in everyday life, the old script is still known and practised by some enthusiasts. Modern Hungarian is written using an expanded Latin alphabet, and has a phonemic orthography, i.e. pronunciation can generally be predicted from the written language. In addition to the standard letters of the Latin alphabet, Hungarian uses several modified Latin characters to represent the additional vowel sounds of the language. These include letters with acute accents (á, é, í, ó, ú) to represent long vowels, and umlauts (ö and ü) and their long counterparts ő and ű to represent front vowels. Sometimes (usually as a result of a technical glitch on a computer) ⟨ô⟩ or ⟨õ⟩ is used for ⟨ő⟩, and ⟨û⟩ for ⟨ű⟩. This is often due to the limitations of the Latin-1 / ISO-8859-1 code page. These letters are not part of the Hungarian language, and are considered misprints. Hungarian can be properly represented with the Latin-2 / ISO-8859-2 code page, but this code page is not always available. (Hungarian is the only language using both ⟨ő⟩ and ⟨ű⟩.) Unicode includes them, and so they can be used on the Internet. Additionally, the letter pairs ⟨ny⟩, ⟨ty⟩, and ⟨gy⟩ represent the palatal consonants /ɲ/, /c/, and /ɟ/ (a little like the "d+y" sounds in British "duke" or American "would you")—a bit like saying "d" with the tongue pointing to the palate. Hungarian uses ⟨s⟩ for /ʃ/ and ⟨sz⟩ for /s/, which is the reverse of Polish usage. The letter ⟨zs⟩ is /ʒ/ and ⟨cs⟩ is /t͡ʃ/. These digraphs are considered single letters in the alphabet. The letter ⟨ly⟩ is also a "single letter digraph", but is pronounced like /j/ (English ⟨y⟩), and appears mostly in old words. The letters ⟨dz⟩ and ⟨dzs⟩ /d͡ʒ/ are exotic remnants and are hard to find even in longer texts. Some examples still in common use are madzag ("string"), edzeni ("to train (athletically)") and dzsungel ("jungle"). 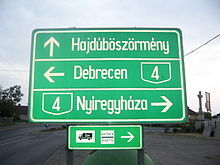 Sometimes additional information is required for partitioning words with digraphs: házszám ("street number") = ház ("house") + szám ("number"), not an unintelligible házs + zám. When the first lexeme of a compound ends in a digraph and the second lexeme starts with the same digraph, both digraphs are written out: jegy + gyűrű = jegygyűrű ("engagement/wedding ring", jegy means "sign", "mark". The term jegyben lenni/járni means "to be engaged"; gyűrű means "ring"). Usually a trigraph is a double digraph, but there are a few exceptions: tizennyolc ("eighteen") is a concatenation of tizen + nyolc. There are doubling minimal pairs: tol ("push") vs. toll ("feather" or "pen"). While to English speakers they may seem unusual at first, once the new orthography and pronunciation are learned, written Hungarian is almost completely phonemic (except for etymological spellings and "ly, j" representing /j/). The word order is basically from general to specific. This is a typical analytical approach and is used generally in Hungarian. The Hungarian language uses the so-called eastern name order, in which the surname (general, deriving from the family) comes first and the given name comes last. If a second given name is used, this follows the first given name. For clarity, in foreign languages Hungarian names are usually represented in the western name order. Sometimes, however, especially in the neighbouring countries of Hungary – where there is a significant Hungarian population – the Hungarian name order is retained, as it causes less confusion there. For an example of foreign use, the birth name of the Hungarian-born physicist, the "father of the hydrogen bomb" was Teller Ede, but he immigrated to the United States in the 1930s and thus became known as Edward Teller. Prior to the mid-20th century, given names were usually translated along with the name order; this is no longer as common. For example, the pianist uses András Schiff when abroad, not Andrew Schiff (in Hungarian Schiff András). If a second given name is present, it becomes a middle name and is usually written out in full, rather than truncated to an initial. The Hungarian name Kiss János is in the Hungarian name order (János is equivalent to John), but the foreign name John Travolta remains in the western name order. Before the 20th century, not only was it common to reverse the order of foreign personalities, they were also "Hungarianised": Goethe János Farkas (originally Johann Wolfgang Goethe). This usage sounds odd today, when only a few well-known personalities are referred to using their Hungarianised names, including Verne Gyula (Jules Verne), Marx Károly (Karl Marx), Kolumbusz Kristóf (Christopher Columbus; note that the last of these is also translated in English from the original Italian or possibly Ligurian). Some native speakers disapprove of this usage; the names of certain historical religious personalities (including popes), however, are always Hungarianised by practically all speakers, such as Luther Márton (Martin Luther), Husz János (Jan Hus), Kálvin János (John Calvin); just like the names of monarchs, for example the king of Spain, Juan Carlos I is referred to as I. János Károly or the queen of the UK, Elizabeth II is referred to as II. Erzsébet. Japanese names, which are usually written in western order in the rest of Europe, retain their original order in Hungarian, e. g. Kuroszava Akira instead of Akira Kurosawa. The year and day are always written in Arabic numerals, followed by a full stop. The month can be written by its full name or can be abbreviated, or even denoted by Roman or Arabic numerals. Except for the first case (month written by its full name), the month is followed by a full stop. Usually, when the month is written in letters, there is no leading zero before the day. On the other hand, when the month is written in Arabic numerals, a leading zero is common, but not obligatory. Except at the beginning of a sentence, the name of the month always begins with a lower-case letter. Hours, minutes, and seconds are separated by a colon (H:m:s). Fractions of a second are separated by a full stop from the rest of the time. Hungary generally uses the 24-hour clock format, but in verbal (and written) communication 12-hour clock format can also be used. See below for usage examples. Date and time may be separated by a comma or simply written one after the other. Date separated by hyphen is also spreading, especially on datestamps. Here – just like the version separated by full stops – leading zeros are in use. When only hours and minutes are written in a sentence (so not only "displaying" time), these parts can be separated by a full stop (e.g. "Találkozzunk 10.35-kor." – "Let's meet at 10.35. "), or it is also regular to write hours in normal size, and minutes put in superscript (and not necessarily) underlined (e.g. "A találkozó 1035-kor kezdődik." or "A találkozó 1035-kor kezdődik." – "The meeting begins at 10.35."). Délelőtt (de.) 9 a.m. – 12 p.m.
Éjjel 11 p.m. – 4 a.m.
* "Dél" and "éjfél" mean these exact times, so using time after them is incorrect. So there is no "Éjfél 0-kor még buliztunk" ("We were still partying at *midnight 0.") or "Dél 12-kor süt a nap." ("The sun shines at *noon 12."). Instead "Éjfélkor még buliztunk." and "Délben süt a nap." is correct. (More confusingly, one can say "Déli 12-kor süt a nap. ", meaning "The sun shines at 12 of noon. ", i.e. "The sun shines at 12, which is the 12 of daytime.") "Délen süt a nap" on the other hand means "The sun shines in the south", as Dél means both noon and south. Note: The stress is always placed on the first syllable of each word. The remaining syllables all receive an equal, lesser stress. All syllables are pronounced clearly and evenly, even at the end of a sentence, unlike in English. Formal, when addressing a stranger: "Good day! ": Jó napot (kívánok)! [joːnɒpot ki:vaːnok]. Do you speak English? : Beszél(sz) angolul? [bɛseːl / bɛseːls ɒŋɡolul] Note that the fact of asking is only shown by the proper intonation: continually rising until the penultimate syllable, then falling for the last one. MagyarOK – Text book and exercise book for beginners. Szita, Szilvia; Pelcz, Katalin (2013). Pécs; Pécsi Tudományegyetem. MagyarOK website ISBN 978-963-7178-68-9. Colloquial Hungarian – The complete course for beginners. Rounds, Carol H.; Sólyom, Erika (2002). London; New York: Routledge. ISBN 0-415-24258-4. This book gives an introduction to the Hungarian language in 15 chapters. The dialogues are available on CDs. Teach Yourself Hungarian – A complete course for beginners. Pontifex, Zsuzsa (1993). London: Hodder & Stoughton. Chicago: NTC/Contemporary Publishing. ISBN 0-340-56286-2. This is a complete course in spoken and written Hungarian. The course consists of 21 chapters with dialogues, culture notes, grammar and exercises. The dialogues are available on cassette. These course books were developed by the University of Debrecen Summer School program for teaching Hungarian to foreigners. The books are written completely in Hungarian and therefore unsuitable for self study. There is an accompanying 'dictionary' with translations of the Hungarian vocabulary into English, German, and French for the words used in the first two books. Gyakorló magyar nyelvtan / A Practical Hungarian grammar (2009, 2010). Szita Szilvia, Görbe Tamás. Budapest: Akadémiai Kiadó. 978 963 05 8703 7. A practical Hungarian grammar (3rd, rev. ed.). Keresztes, László (1999). Debrecen: Debreceni Nyári Egyetem. ISBN 963-472-300-4. Simplified Grammar of the Hungarian Language (1882). Ignatius Singer. London: Trübner & Co. Practical Hungarian grammar: [a compact guide to the basics of Hungarian grammar]. Törkenczy, Miklós (2002). Budapest: Corvina. ISBN 963-13-5131-9. Hungarian verbs and essentials of grammar: a practical guide to the mastery of Hungarian (2nd ed.). Törkenczy, Miklós (1999). Budapest: Corvina; Lincolnwood, [Ill.]: Passport Books. ISBN 963-13-4778-8. Hungarian: an essential grammar (2nd ed.). Rounds, Carol (2009). London; New York: Routledge. ISBN 0-415-77737-2. Hungarian: Descriptive grammar. Kenesei, István, Robert M. Vago, and Anna Fenyvesi (1998). London; New York: Routledge. ISBN 0-415-02139-1. ^ This number is a lower estimate, as 382,493 people (7.0% of the total population) did not specify their mother tongue. ^ Government of Croatia (October 2013). "Peto izvješće Republike Hrvatske o primjeni Europske povelje o regionalnim ili manjinskim jezicima-Fifth report on implementation of the European Charter for Regional and Minority Languages" (PDF) (in Croatian). Council of Europe. p. 34-36. Retrieved 18 March 2019. ^ Hammarström, Harald; Forkel, Robert; Haspelmath, Martin, eds. (2017). "Hungarian". Glottolog 3.0. Jena, Germany: Max Planck Institute for the Science of Human History. ^ "The World Factbook — Central Intelligence Agency". Cia.gov. Retrieved 8 October 2017. ^ Lebedynsky, Iaroslav, Les Nomades: Les peuples nomades de la steppe des origines aux invasions mongoles [The Nomads: the steppe nomad people from origins to Mongol invasions] (in French), p. 191 . ^ Maxwell, A. Magyarization, Language Planning and Whorf: The word Uhor as a Case Study in Linguistic Relativism Multilingua 23: 319, 2004. ^ Abondolo, Daniel (1998). "Introduction". The Uralic Languages. London: Routledge. pp. 1–42. ^ Abondolo, Daniel (1998). "Hungarian". The Uralic Languages. London: Routledge. p. 453. ^ Attila Türk, A magyar őstörténet és a szaltovói régészeti kultúrkör. PhD, University of Szeged, 2011 . ^ András Róna-Tas & Árpád Berta, West Old Turkic: Turkic Loanwords in Hungarian. Part 1: Introduction, A-K (Wiesbaden: Harrassowitz, 2011), 151-2. ^ Róna-Tas & Berta, WOT 2011/1: 291-4. ^ "Hungary – Early history". Library of Congress (public domain). Retrieved 2008-06-29. ^ Sala, Marius (1988). Vocabularul reprezentativ al limbilor romanice. Bucharest: Editura Ştiinţifică şi Enciclopedică. ^ Kim Schulte, "Loanwords in Romanian", Loanwords in the World's Languages: A Comparative Handbook (Berlin: De Gruyter Mouton, 2009), 239. ^ Miklós Zsirai: Őstörténeti csodabogarak. Budapest, 1943. ^ Marcantonio, Angela; Nummenaho, Pirjo; Salvagni, Michela (2001). "The "Ugric-Turkic Battle": A Critical Review" (PDF). Linguistica Uralica (2/2001). Retrieved 8 October 2017. ^ Katalin É Kiss (2014). The Evolution of Functional Left Peripheries in Hungarian Syntax. Oxford University Press. p. 76. ISBN 978-0-19-870985-5. ^ Robert B. Kaplan; Richard B. Baldauf (2005). Language Planning and Policy in Europe. Multilingual Matters. p. 55. ISBN 978-1-85359-811-1. ^ Eric Mathieu; Robert Truswell (2017). Micro-Change and Macro-Change in Diachronic Syntax. Oxford University Press. pp. 66–. ISBN 978-0-19-874784-0. ^ a b "Központi Statisztikai Hivatal". Ksh.hu. Retrieved 8 October 2017. ^ "Romanian census 2011" (PDF). Recensamantromania.ro. Retrieved 8 October 2017. ^ Bureau, U.S. Census. "American FactFinder - Results". factfinder.census.gov. Retrieved 8 October 2017. ^ "File Not Found". 12.statcan.ca. Retrieved 8 October 2017. ^ "SBS Census Explorer". Sbs.com.au. Retrieved 8 October 2017. ^ "Hungarian". Ethnologue.com. Retrieved 8 October 2017. ^ Szabó, Éva (2005). Hungarian Practical Dictionary: Hungarian-English, English-Hungarian. New York: Hippocrene Books. p. 9. ^ Ward, Judit Hajnal (2002). Hungarian-English/English-Hungarian: Dictionary & Phrasebook. Hippocrene Books. p. 1. ^ Bureau, U.S. Census. "American FactFinder - Search". factfinder.census.gov. Retrieved 8 October 2017. ^ "Romania: Law Allows Use Of Minority Languages In Public Administration". RadioFreeEurope/RadioLiberty. Retrieved 2018-10-30. ^ Ujsag, Kanizsa. "Miért tegezik a magyarokat a multik? - Kanizsa Újság". Kanizsaujsag.hu. Retrieved 8 October 2017. ^ a b c d ""Related words" in Finnish and Hungarian". Helsinki University Bulletin. Retrieved 2008-06-15. ^ "PROTO-MAGYAR TEXTS FROM THE MIDDLE OF 1st MILLENIUM?". Rmki.kfki.hu. Retrieved 8 October 2017. ^ "It's written in chapter Testrészek". Nemzetismeret.hu. Retrieved 2010-01-31. ^ "Category:Hungarian cardinal numbers - Wiktionary". en.wiktionary.org. Retrieved 8 October 2017. ^ "Category:hu:Days of the week". Wiktionary. Retrieved 8 October 2017. ^ "Category:hu:Months". Wiktionary. Retrieved 8 October 2017. For a list of words relating to Hungarian language, see the Hungarian language category of words in Wiktionary, the free dictionary. Wikimedia Commons has media related to Hungarian language. Wikivoyage has a phrasebook for Hungarian.